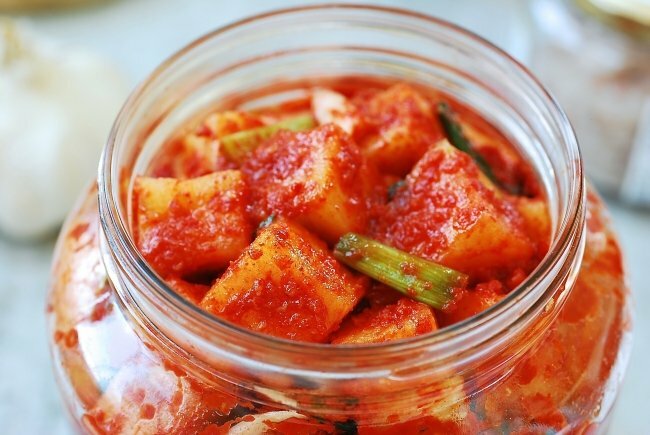 Kkakdugi is a kimchi made with Korean radish, mu (or moo). 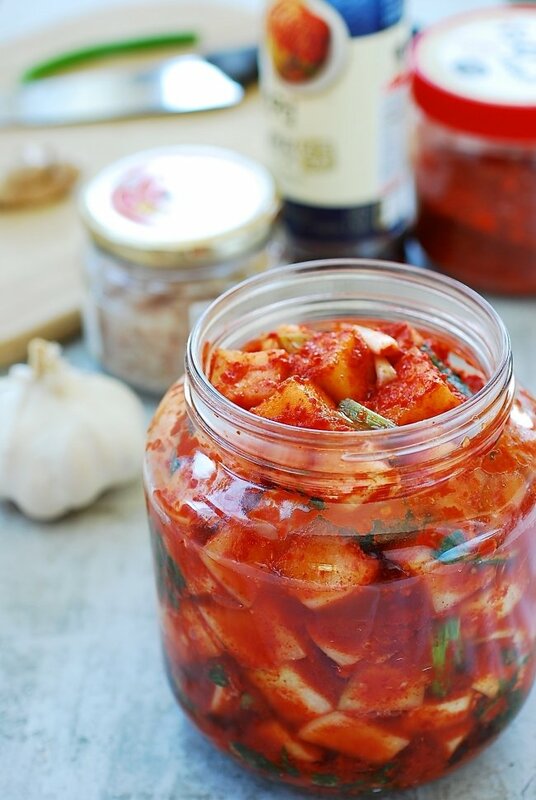 It’s an easy kimchi to make! Simply cut the radishes into cubes, salt for a short time, and then mix with the seasonings. 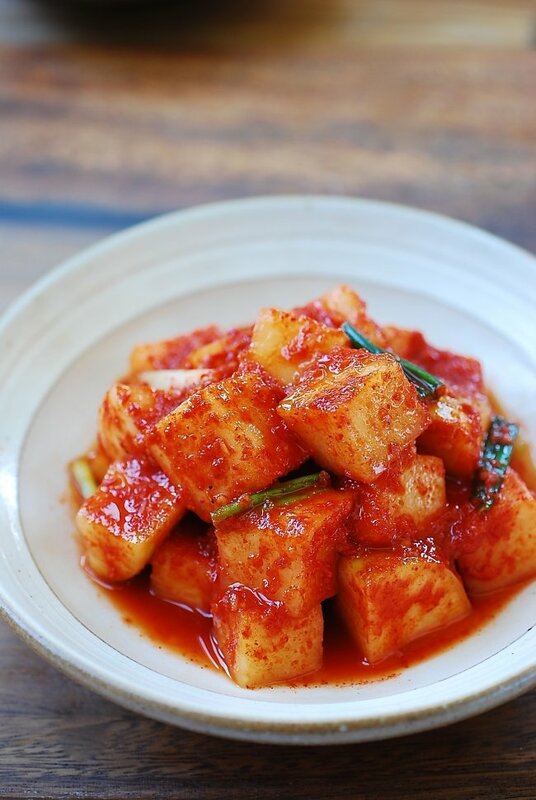 Kkakdugi (깍두기) is a kimchi made with Korean radish, mu (or moo, 무). 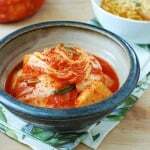 It’s an easy kimchi to make! Simply cut the radishes into cubes, salt for a short time, and then mix with the seasonings. 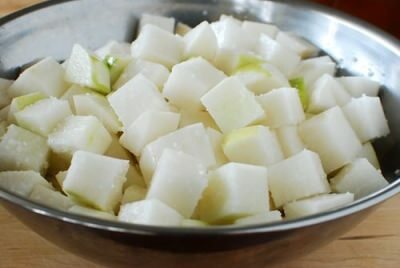 The name kkakdugi comes from how the radish is cut — cubed, and it’s known as cubed radish kimchi in English. This recipe was originally posted in Nov. 2011. Where did the time go? Here, I’ve updated it with new photos and streamlined recipe steps. 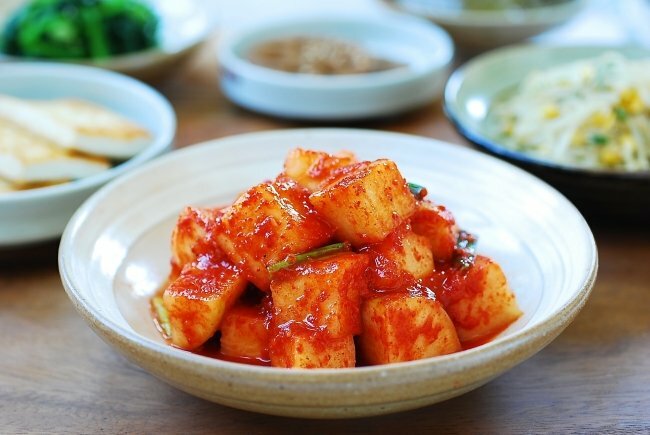 Although Korean radish, mu (or moo), is a cool weather vegetable, kkakdugi is enjoyed all year round! Korean radish is a variety of white radish and has firm crisp flesh and a slightly sweet and peppery taste. Summer radish can be slightly bitter. You can add more sugar than what the recipe calls for to balance out the bitterness. 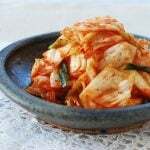 The taste of kimchi depends a lot on the types, the quality, and the ratio of the seasoning ingredients. Each Korean household has its own ways. I find myself making it differently each time. 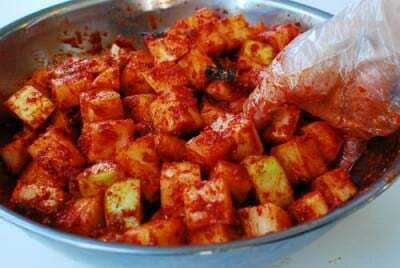 Traditionally, various jeotgal (젓갈, salted seafood) are used in kimchi for the depth of flavors. Saeujeot (새우젓, salted shrimp) and myulchiaekjeot (멸치액젓, fish sauce made with anchovies) are the two that are most commonly used. I almost always use both of these in my kimchi. Sometimes, I also use fresh shrimp which is my mother’s secret ingredient for adding extra freshness to the kimchi flavor. In this updated recipe, I didn’t use fresh shrimp. However, if you can’t find saeujeot in your area, consider using some raw shrimp instead. You can enjoy kkakdugi with any Korean meal, but it’s especially good with a bowl of mild soup such as seolleongtang, samgyetang, galbitang, and dak gomtang. It’s a delicious side dish that will add a robust spicy kick and some crunch to a meal! 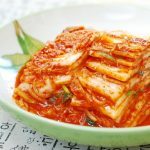 Kkakdugi is an easy and quick kimchi to make. 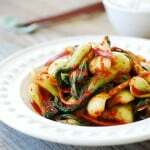 It’s a delicious side dish that will add a pungent kick and some crunch to your Korean meal! Sprinkle the salt over the radishes and toss well to coat evenly. Let sit for about 30 – 40 minutes until the radish cubes have softened and released some liquid. Meanwhile, prepare the seasoning ingredients. Mix everything well. Set it aside for a while for the red pepper flakes to dissolve a little and become pasty. Place the radishes back in the bowl. Add the seasoning mix and scallions. Store in an airtight container or jar. 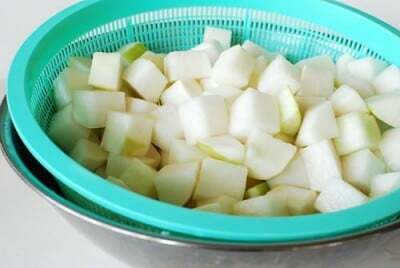 Before closing the lid, press the kkakdugi down hard with your hand to remove air pockets between the radish cubes. 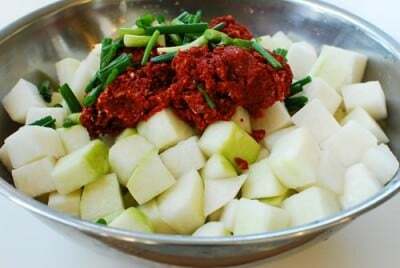 Leave it out at room temperature for a full day or two, depending on the room temperature and how fast you want your kimchi to ripe. Then, store in the fridge. Kkakdugi tastes best after a week or two in the fridge to fully develop the flavors. It maintains great flavor and texture for several weeks. 1. Buy the ones with smooth skins that are firm and heavy. 2. If salted shrimp is not available, increase the fish sauce by the same amount. *Originally posted in Nov. 2011 and updated here with new photos and streamlined recipe steps. 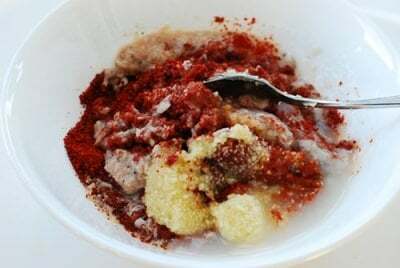 Kkakdugi is my absolute favorite and I’m definitely trying this. Thanks for the step by step! Azusa – Thank you! My family and friends love my kkakdugi. Hope you like it too. 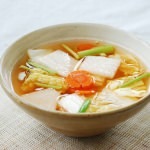 Kkakdugi/radish kimchi makes me crave for a pot of nice beef-the ox tail bone marrow(?)-soup. It was the ultimate Korean winter comfort meal as a child. 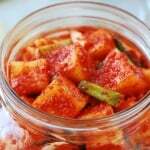 I love kimchi! I have even made it twice, but every time something went wrong and it wasn’t perfect. I guess this is the kind of preparation which gets better with practice. Having real Korean chili counts a lot too. thank you for this recipe! however how do you make glutinous rice paste? ooooohh I love these! Just love them …. Could eat them with rice all day long. So you leave the minced or ground fresh shrimp raw or cook it? Thanks. Charles – I revised it a little to show it’s glutinous rice powder you buy, not paste. Hope you try this recipe and let me know how it turns out. This is how I do it every time, and the result is always great. Holly – I love ox tail soup with kkakdugi too! Then again, who doesn’t? Sissi – You nailed it! The quality of Korean red chili pepper flakes is actually the most important factor for great kimchi. Jesica – Thank you! Hope you get to make your own! Nami – Thank you! White kimchi is pretty much kimchi without red pepper flakes. It’s very refreshing, and I make it sometimes. I hope to post it soon. Anonymous – Please see the note under glutinous rice powder under ingredient for how to make the paste. Thanks! 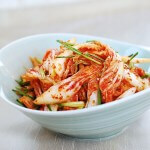 It is raw minced shrimp that’s added to the kimchi, and due to salt content in kimchi, the shrimp will ferment during the fermentation process. Thanks! 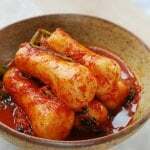 I love kimchi but I have never tried radish kimchi. I don’t know where to get Korean radishes in Germany…:(. I can imagine that this radish kimchi must be so crunchy and yummy! Andrea – Hope you get make them soon. Thanks for visiting. Have a wonderful Thanksgiving with your family! Cooking Gallery – Try with other daikon varieties if you can find. Thanks for visiting! This post is making my mouth water! I just ate some kkakdugi last week with a steaming bowl of sulluntang at a hole in the wall restaurant in Los Angeles. My mom used to take the family there when I was young, and now that I live in LA, I am spoiled with plentiful Korean food and grocery stores. It’s time to start learning to make it myself. Thanks for the recipe! Sarah – Kkakdugi is so good with sullungtang. Thanks for visiting! Hope you try to make this at home one day. Biren – I saw your kkakdugi on your blog. It looked great! Thanks for visiting. Hi Joanne, how are you? Thanks for trying out my recipes. I am not sure how salty it is, but should get better as it ferments and releases more water. It will be much better when fully fermented, so you can leave it out more to expedite the process. However, if you think it is way too salty, you can add some water to dilute it a little now. Also, you can use it for kimchi jjigae or dice them up for kimchi fried rice, etc., when fully fermemnted, if it’s still too salty. Did you use coarse sea salt? Hope this helps. Please let me know how it turns out. Happy New Year! Hi Hyosun, Happy New Year to you too! I added more water and it turned out just right! I did use coarse sea salt but perhaps I was too overenthusiastic in salting the radish =P Thanks for the tip and have a great day ahead! Hi Joanne – Happy to hear that. Thanks for letting me know. Happy cooking! hi Hyosun, great pictures and instructions on your site. I made the Kkakdugi yesterday and it smelled and tasted so good I ate it with dinner. I think the raw prawn and shrimp paste was not fully fermented, it gave me a grumbly tummy all night. How long should I leave it out to ferment before it is safe to eat? I left it out all day today. Also, I didn’t put enough pepper flakes in, can I add more at this stage? My whole family have now adopted korean food and the banchan’s are great for busy working mums like me to ensure our kids get a variety of veges every night. Keep up the good work! 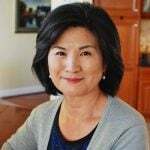 Hi Joyce – Thank you so much for the good words. It’s best to ferment it slowly in the fridge. So if you had it out all day, I’d strongly suggest putting it in the fridge now. Wait one to two weeks before start eating. You can omit raw shrimp next time if you’re sensitive to it. oh also you can add more pepper flakes now. The sooner is the better. Hi! I actually made this three times and twice it turned out perfectly! But the third time, the cubes got too soft even before I put it in the fridge! I was wondering if you knew why that happened. I thought I did everything exactly…Please help! Hi Jenn – If you used all the same ingredients and your radish was good to begin with, it might be that it wasn’t salty enough or being left out at high room temperature too long, i.e., I’ve heard some bad gochugaru does that too, not sure that’s true. Do you think any of these apply? Please let me know. Thanks! The high temperature must have been it! I left it out for a day and a half and it was really hot…wow. Darn it! I love your recipe though and my mom thinks it’s perfect as well. Thank you so much! Love your blog! I bough some salted baby shrimp earlier this year. There was no expiration date on the jar. Do you know how long I can keep it in my fridge? Hi Kathy – It should last long (months), especially if it was unopened. You can tell by its color and smell. If it turned yellowish and smells funny, then don’t use it. It stays fresh longer if you keep it in the freezer. Hope this helps. I tried making this 2 days ago and it came out bland. When I tasted it before letting it sit to ferment it was perfect. After placing it in the fridge for a day then taste it again, the kimchi was bland and not salty enough. Is there anything I can do at this point to correct it? Or should I add more salt next time when making a new batch? Thanks! You can add some fish sauce or salted shrimp (or salt) now – the sooner is the better. Also, the flavor will develop during the fermentation process, so it will taste better even without more salt. Remember next time that the kimchi seasoning should be a bit too salty to eat as is at first. The salt level will diminish during the fermentation process. Hope this helps. Let me know if you have any other questions. Cheers! anyunghaseyo, hyosun! why does gochukaro have an expiration date on the bag? Does it really expire, and if so, what happens to it? I have some that a friend gave me when she moved, but it is a few years past the expiration date! Your thoughts are appreciated. Thank you! Gochugaru doesn’t taste good if it’s that old. The color is probably bad as well. The fresh gochugaru will keep well for a couple of years in the freezer. You can try to use it and see if it tastes okay. But, a few years is a long time for gochugaru. Sorry this may not be a good news for you. Cheers! hi Hyosun, it’s Joyce again (from Aug12 post). I’ve been following this recipe to make Kkakdugi 3 times now. 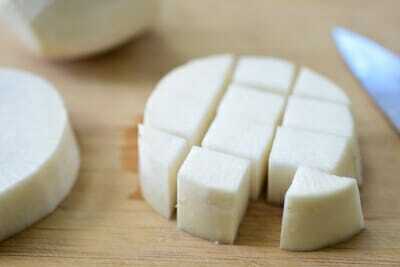 Each times it turns out too salty and the texture of the moo cubes goes soft after 5-6 weeks in the fridge. I used sea salt and tries to follow most of the measurements and portions. Should I wash the radish after salting or just less of the juices in the end broth? The rice flour paste/soup also comes out very thick. I’m about to harvest my first crop of daikon from the garden. The first one I pulled out last week was about 2 ft x 2 inches thick, and we used that to make your beef & radish soup. The kids loved it so much they drank 2 bowls each, yum! I know you’re busy, if you have time can you give me some ideas what do to with them all while they are fresh? I’ve got about 8-10 of similar size daikons to harvest, and we already have a big jar of Dongchimi in the fridge. My kids are still young, so can’t take too spicy dishes as yet. My youngest loves your Dongchimi, he can eat it by the mouthful! Hi Joyce! You said “Should I wash the radish after salting or just less of the juices in the end broth?” I’m not sure what you mean by “less of the juices in the end broth”. Are you using the liquid generated by salting the radish? My recipe says “Drain the radishes in a colander and discard the liquid. Do NOT rinse.” If you’re doing this but it’s still salty, just use less salt next time. It’s okay the flour paste to be thick, but you can add more water to make it thinner. 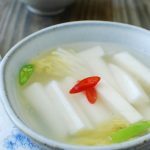 Are you using Korean radish or Japanese daikon? Japanese daikon tends to be softer, which is not ideal for kkakdugi. Also, kkakdugi tends to get a little softer when it gets really old. If it gets too soft prematurely, it could be some ingredients or fermented too soon at the high temperature. I’ve heard some bad gochugaru does that too. It’s so cool you grow radishes in your garden. Are they Korean radish? Have you made mu namul? How about mu saengchae? Both are on this blog. Also, you can cut them up into finger sizes and dry them. Koreans do that to preserve radish for later use. You can simply soak them later and make “muchim” with spicy seasoning. I haven’t posted a recipe for that yet, but it’s on my list. Hope this helps. Thanks always for using my recipes and providing feedback! Is it ok if i dont use the prawn? Or can i boil the prawn first? Nia – It’s totally okay not to use prawns. Don’t use cooked prawns. Enjoy! Can I add 1/2 of grated apple to this to make it sweeter and softer but yet still crunchy? I haven’t used apple in my kkakdugi, but I’m sure it will work. Let me know how it turns out. Thanks! If I want this spicy and sweet, how many Tablespoons of sugar should I add? Awesome recipes! I’ve been printing several off to have on hand, but I can’t find the printer friendly option for this page. Am I missing it, or is it just not here? I get hungry looking at this article! I recently discovered radish Kimchi. i didn’t know what it was,just that it was very good.The next time I bought a jar the lady at the market seemed to be impressed that I was buying this type of Kimchi.I told her it was very good,and asked her what it was made of and she told me.I certainly did not relize radishes could taste so good! How did it go? What did you like or didn’t like about the recipe? 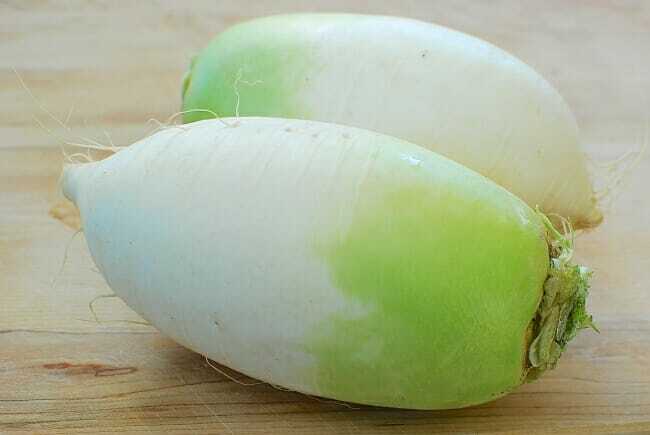 Hi Hyosun, I was wondering if I can use daikon radish instead of the Korean radish? Would they taste the same? Yes are they are a bit different in taste and texture, but you can certainly make kkakdugi with daikon radish if Korean radish is not available. Sorry about the delayed response. Your recipes are easy to follow and my husband and his family (korean) all compliment the side dishes I make. Thank you for sharing your great recipes with us! Aww I’m so happy to hear that! Thank you so much for using my recipes. Happy New Year! If i dont use salted shrimp will it be fine? Cause in my coutry have that shrimp but not like the one in the picture so what should i do? Just use more fish sauce if available. Which brand of kochugaru did you use? I used the one bought by my late MIL and the radish isn’t as red. Mine comes from Korea in bulk, so I really don’t have a brand name to recommend to you. Unlike gochujang or doenjang, for gochugaru there are no big names. 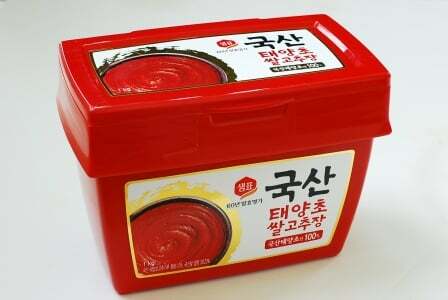 Usually gochugaru from Korea is high quality and much more expensive with certifications from Korean food quality control organizations.